As I sat in the theater tonight, I thought, "Why didn't anyone tell me how great this movie is??" Well, it's been on every top ten list, usually first or second, so, duh . . . people told you. But I had convinced myself that it was a much-admired movie, not a much-loved one. How wrong I was. Spielberg, as always, can tell a story like nobody's business. Set, music, blah blah blah. All good. The acting? Wondrous. There was plenty of room for histrionics (Mary Todd Lincoln) and mugging (the comic relief of the fixers, the chief of whom is played brilliantly by James Spader). But not a single performance goes off the rails into melodrama or exaggeration. 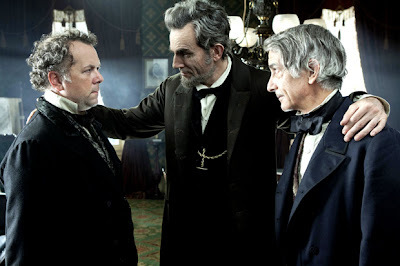 And Daniel Day-Lewis does the seemingly impossible, marrying the quiet, even awkward dignity of our public idea of Lincoln with the charisma and cleverness that we know he must have had because you don't get to the presidency without them. He's a whole, seamless psychological being. He's quiet, then he starts telling a folksy story, then he's chatting away like a gossip, then he's intense and focused, and so on and so forth. Even when he slams his palm on the table and gets all bossy, it feels like one and the same person, and it's not exploited with halo lighting and prolonged into A Moment. There's something in Spielberg's direction that's not insistent, that doesn't try to shove [Lincoln's greatness, the fixers' charm, Mary Todd's complexity, take your pick] down your throat. in his lovable curmudgeonliness and disdain for the opinion of others. I'm certain that Daniel Day-Lewis will win the Oscar for Best Actor, but how about Best Supporting Actor for James Spader? I'd be on board with that, if only for the scene in which he belated realizes that they guy he's been chatting up at a public house is trying to kill him. 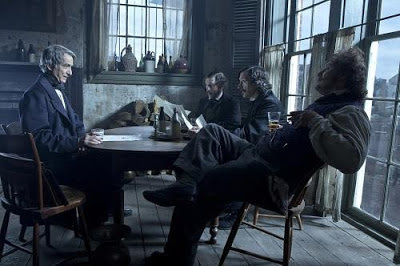 I also like the scene in which Lincoln surprises the fixers at their makeshift headquarters and it takes about three minutes for both Lincoln and Spade's character to realize they're the smartest people in the room. 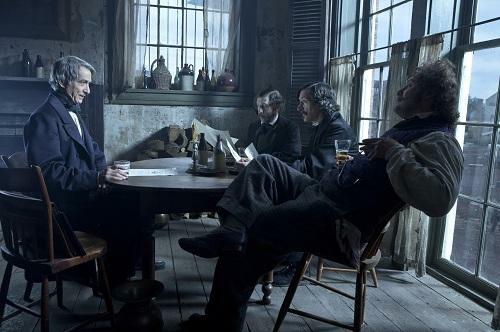 This is another way that both the script and Daniel Day-Lewis nail it, by making evident how very, very smart Lincoln was. It's easy for the public personas of people like him (salt-of-the-earth Lincoln, Bubba Clinton) to obscure their razor-sharp minds. Here's a puzzle: How can a vote, a historical congressional vote whose outcome we already know with complete certainty, be so very suspenseful?